Proper preoperative planning and standardized surgical procedures can foster improved outcomes in hammertoe repair. This author offers a closer look at examination essentials, imaging modalities, the importance of the plantar plate and recent advances in hammertoe implants. The prevailing thinking with hammertoe correction has dramatically evolved in the past decade. Much of the current understanding is based on extensive studies on surgical repair of the metatarsophalangeal joint (MPJ) and the toe itself. This understanding has allowed for improved preoperative planning and surgical management of an often complicated and difficult problem to treat. As residents, the main procedure we performed with hammertoe correction was a sequential release of the MPJ. From an extensor lengthening to an MPJ capsular release to a complete degloving of the metatarsal head, we sequentially released each structure until there was nothing left holding the toe in joint. We then placed a pin across the joint. Sometimes, we would get lucky and the toe would stay in place. Sometimes, we would be unlucky and the toe would still contract. Rarely did the toe purchase the ground properly. Furthermore, arthroplasty versus fusion of the toe was very much a surgeon’s choice, resulting in differing levels of stability and swelling, and inconsistent alignment. Some toes went medial, some got fat and swollen, and some would be dorsally contracted. Accordingly, the goal of this article is to try to standardize the care of hammertoe deformities and associated problems with the MPJ. Hammertoes on the surface involve a simple buckling of the lesser toes due to a tendon imbalance of the foot. If there is an imbalance between the extensor and flexor tendon function of the toe, there will be associated buckling of the toe, resulting in a hammertoe. Surgeons have expanded on this simple concept with a better understanding of the multiple tendinous and ligamentous structures of the MPJ, and the associated complex pulls on the toe by these structures. The plantar plate, ligamentous structures, lumbricals and tendons all place differing levels of stress on the MPJ and toe, resulting in a complex push and pull mechanism. With better understanding of the mechanisms and functions of each of these structures, there has been an evolution in the thinking of hammertoe correction. When it comes to primary deforming forces, the main three structures to consider are the extensor, the flexor and the plantar plate, or lack thereof. The single most commonly missed problem in poor hammertoe outcomes is the function of the plantar plate and collateral structures, which are truly a continuation of one and the same structure within the concept of hammertoe correction. The examination of a patient with a hammertoe deformity is the main starting point. One should analyze the toe and hammertoe for rigidity, medial and lateral deviation, and dorsal contraction. Check the plantar plate as well as the medial and lateral collateral ligaments for stability. Also check the general foot position and muscle balance, and check for associated deformities such as hallux valgus, an abnormal metatarsal parabola and equinus. I begin with a standing examination of the patient. Pay attention to medial deviation more than lateral deviation of the toes with the patient standing. Patients with rheumatoid arthritis may have lateral deviation of the toes but in the normal patient, medial deviation due to weakness of the lateral plantar plate and ligamentous structures is far more common. I also check to see how well the toe reduces in a standing position in a dorsal to plantar position. Any form of dorsal contracture and medial shift of a toe at the MPJ with hammering needs further workup for possible plantar plate issues. With the patient in a sitting position, check the rigidity of the hammertoe. If possible, reduce the hammertoe and place plantar stress on the associated MPJ to see if the toe sits properly or diverges. If there is divergence, use a dorsal drawer test to check the function of the plantar plate and place plantar pressure on the MPJ/toe junction to see if there is pain. Check the strength of the extensor tendon and flexor tendon. Also check for muscle - weakness of the anterior tibial tendon or the posterior compartment musculature as this may contribute to overuse of the extensor and flexor tendons. This must be a consideration when it comes to surgical planning. Finally check the associated metatarsal length, hallux valgus deformity and general foot position. It is also important to consider a neuroma as a source of hammertoe pain as certain cases of hammertoe deformity may be due to pain from an intermetatarsal neuroma radiating to the toe. One can primarily use standard radiographs to check the foot and bone positions. While the hammertoe is hard to check or assess on radiographs, X-rays are very important for checking general foot alignment, the metatarsal parabola, bunion deformity and especially medial or lateral deviation. Weightbearing X-rays are far more preferred to non-weightbearing X-rays. Further testing of the foot may be necessary in non-standard hammertoe deformities, which are far more common than you think. Diagnostic ultrasound, in the proper hands, is the best single examination of the MPJ and associated structures as it is a dynamic test. One can stress the MPJ and put it through range of motion while the ultrasound checks the plantar plate and collateral functions. Furthermore, employing ultrasound also allows you to check for neuromas, possible cysts, tendon tears or inflammation of the MPJ. Although ultrasound is an excellent test, it is very operator dependent and a high level of skill is necessary for proper diagnosis by a foot and ankle surgeon. A diagnostic radiologist, however, can be a very valuable resource for ultrasound examinations until the foot and ankle surgeon has a good working experience with an ultrasound machine. The gold standard test for MPJ analysis is a magnetic resonance imaging study (MRI). Obtaining a MRI enables you to check the plantar plate, tendinous and ligamentous structures, neuromas and arthritic conditions of the toes or MPJ. In my view, one of the best additions to normal MRI sequencing is doing a T1 and T2 sequence from a lateral position with the toes pulled into a dorsal position. Getting these views with the dorsal positioning of the toes allows a better evaluation of the function of the plantar plate structures. Pay special attention to the toe that you suspect of having a plantar plate issue. In certain cases, you may only want to assess the toe with a potential plantar plate tear in a dorsal position at the MPJ. One can easily facilitate this with a rolled-up Webril or a piece of tape. Our organization is currently investigating the use of 3D computed tomography (CT), a newer test that may be beneficial in assessing hammertoes. It is best to perform this testing with a 3D weightbearing CT scanner. One can use the modality to check the weightbearing position of the toe and MPJ, ascertain if there are degenerative changes, and also check for associated abnormalities and position of the foot. Although clinicians would not normally use this testing for most forefoot assessments, a weightbearing CT can be very useful in the right situations and surgeons can often use it in lieu of X-rays as they can reconstruct a radiographic analysis of the foot based on the CT scan. The surgical planning for hammertoes is far more complex than what I learned as a resident. Once examination and testing are complete, one has to consider not only the hammertoe correction but the stability and alignment of the MPJ as well. Do this prior to surgery and explain it in detail to the patient both verbally and in the patient consent form. Although changes may be necessary during surgery, the better one outlines the procedure to the patient prior to surgery, the fewer surprises there are for the patient. I recommend explaining the function of the ligaments and plantar plate, the metatarsal length and associated muscle imbalance and hallux valgus issues. Finally, consider the idea of an arthroplasty versus a fusion procedure based on the patient’s daily function, aesthetic expectations and age. I make a point of explaining the potential need for plantar plate repair, metatarsal osteotomy, hallux valgus correction and differing hammertoe correction options to patients prior to surgery. Unless the patient is very old and has multiple other medical conditions precluding a more lengthy surgery and recovery, I will rarely perform an arthroplasty of toes two through four and prefer a fusion procedure. This allows better positioning of the toe, less swelling and a more standardized outcome. It is also rare that I will not correct a plantar plate tear. We often overlook the function of the plantar plate. If we do not properly address the plantar plate, it may result in a straight toe that either does not purchase the ground or shifts medially or laterally. When it comes to treating hammertoe deformities, one often needs to address an associated hallux valgus deformity as well. This allows better weight distribution across the forefoot and decreases lesser metatarsal overload and plantar plate stress. Finally, I have noted that a missed neuroma may sometimes become more problematic after hallux valgus correction and/or hammertoe and metatarsal repositioning. Pay close attention to an underlying neuroma, which may not be painful prior to surgery but may become painful after surgery. The equipment necessary for hammertoe correction has also changed from a possible Kirschner wire to a significant number of devices that one can use to correct a multitude of problems. There are multiple hammertoe implants that are currently available. I will try to detail what I prefer to use and why. These are by no means the only options but just my suggestions. For hammertoe correction, I have moved to a polyetheretherketone (PEEK) single-piece hammertoe implant that allows me to lock the hammertoe into the joint and also allows for a slight 10 degree angulation of the toe if desired. The CrossTIE (CrossRoads Extremity Systems) implant has a single hole at the distal tip and is press fitted into the proximal phalanx. With a small 0.045 K-wire hole in the middle phalanx, one can pass a suture through the implant to tie it into the tendon structure dorsally on the toe, allowing for compression of the toe and improved pullout strength. I prefer the CrossTIE as my primary type of implant as PEEK allows for implant removal if necessary and I can actually get a compressed position of the toe with the suture tie-in. In cases of osteoporotic bone, I use a headless screw (ExtremiFix, OsteoMed), which I place through the tip of the toe across both the interphalangeal joints to achieve true compression. Both of these implants allow for removal should it be necessary. I also have found the OsteoMed headless screw far easier to remove than a headed screw. What I do not like about the screw technique is that the toe is very straight with a screw at both the proximal and distal interphalangeal joints. For this reason, I prefer a buried implant across the proximal interphalangeal joint, which allows better anatomic positioning of the toe and no stiffness at the distal interphalangeal joint. The plantar plate correction requires its own set of instruments. Currently, there are two plantar plate repair options on the market from Arthrex (Complete Plantar Plate Repair System) and Smith and Nephew (Hat-Trick Lesser Toe Repair System). Both are excellent but the Smith and Nephew system allows for more treatment options in my hands, and is also designed to allow for plantar plate and ligament repair, which is my preference. Furthermore, the Smith and Nephew system offers a complete system that includes a metatarsal osteotomy guide to facilitate proper angulation, a PEEK two-piece hammertoe implant system and a plantar plate/ligament repair system. Finally, the Smith and Nephew system does not require a metatarsal osteotomy and also has a PEEK interference screw, which offers better plantar plate stabilization, decreasing friction stress of the suture through the toe, which can be a source of problems in certain cases. I prefer to perform the associated procedures for any forefoot surgery prior to addressing the hammertoe deformity. This includes the bunionectomy, tailor’s bunionectomy and possible neuroma excision. This also decreases stress on the toe and possible MPJ correction during the other procedures. Furthermore, consider the MPJ positions and metatarsal parabola with regard to the position of the corrected first and fifth metatarsals. One may perform the hammertoe correction through longitudinal or transverse ellipse options. If MPJ work is not necessary, especially if the plantar plate is not symptomatic, a transverse ellipse incision is preferable for aesthetic purposes. Release and protect the extensor. One can also release the extensor medially and laterally across the MPJ, and protect it proximally for lateral repair if MPJ work is necessary. I prefer to keep the cup and cone contour of the toe and use a combination of a rongeur and a burr for debridement of the toe joints. I will consistently bring the toe into a rectus position and try to get the bones to touch without shortening during my debridement. By having touching bones during the rectus alignment, there is less chance of the bones pulling apart during the attempted fusion. The only time I will resect bone is if I need to shorten the toe significantly and even in that case, I will still keep a cup and cone alignment. A cup and cone alignment allows for better rotation correction and slight plantarflexion of the toe during the fusion alignment process. I will prepare the toe for fusion and then open the realigned MPJ to release it prior to placement of the toe into the final position. If there is a plantar plate tear, I will more often than not perform a metatarsal osteotomy to decrease load on the MPJ. Also, if I am going to perform a metatarsal osteotomy, I often find an imbrication of the plantar plate or at least an extensor lengthening and repair are necessary for proper balancing of the toe. Surgeons may perform the plantar plate repair unilaterally or completely. It is rare for me to perform a complete plantar plate repair as the usual tear is lateral. Therefore, I prefer only repairing the lateral plantar plate with a wedge resection of the plate and subsequent lateral collateral repair. However, if I perform a metatarsal osteotomy and find the toe is dorsally drifting on the table with an insufficient plantar plate, I will imbricate the entire plate structure and both collaterals. Finally, one may shift the metatarsal slightly medial or lateral during the procedure to allow for some correction of the toe position with an osteotomy. Once the MPJ is stable and aligned, I will perform the final hammertoe implant placement and realign the toe accordingly. I will try to check the quality of the bone prior to placement of the implant and plan on using the implant best suited to the bone quality at the time of the procedure. That being said, I have found that in most patients, screw fixation is rarely necessary and many of the internal hammertoe implants are fine. I have stopped using metal implants as they are very difficult to remove and are also so strong that they may fracture through the fragile bone of the toes, either during surgery or during the postoperative period. Repair the extensor tendon and close the incision with your desired suture. I wrap my toes with Coban for added stability. I will place a strip of Coban around the MPJ and hold the MPJ in a plantarflexed position in cases of MPJ dorsal release or plantar plate repair. The patient wears a controlled ankle motion (CAM) boot for protection. 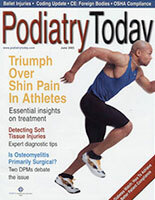 I prefer a CAM boot to a surgical shoe as it offers better protection and decreased stress on the tendons and joints. At the first postoperative visit, remove the sutures and have the patient initiate range of motion of the toe(s), especially if MPJ work has occurred. The biggest problem I have noted with MPJ surgery is stiffness of the MPJ, especially with plantar plate repair. With proper suturing of the plantar plate, range of motion can start on the first postoperative visit after suture removal and the main motion is plantarflexion more than dorsiflexion. One can apply dorsal stress gently but plantar stress can be more forceful as there is less stress on the plantar plate with plantar stress. Encourage patients to keep the toe wrapped with Coban in order to decrease swelling and allow stability. Also allow active range of motion in both dorsal and plantar manners at the two-week point. Recheck the foot at the four- to five-week point and begin active physical therapy. At times, physical therapy may start at week three but it is more common to start at week four. The patient works on tendon strength and one should emphasize range of motion. The patient also works on toe grip strength. He or she should continue with Coban wrap of the toe(s) for three months. The patient may return to a stiff-soled shoe at week six and increase activity at week eight. Advise the patient that there may be swelling for up to three months. Total healing may occur at three months. With proper planning and guidance, adequate imaging and surgical planning, hammertoe outcomes can be far more standard. Improvements in the understanding of tendon and ligament function at the MPJ and on the toe have allowed for far better understanding of the cause and treatment of hammertoes. The plantar plate is a critical stabilizer of the MPJ and toe, and one must address this for proper alignment and position of the corrected toe. Finally, hammertoe implants have allowed for better fixation, earlier range of motion and minimal need for external pin use in association with hammertoe and MPJ correction. Dr. Baravarian is an Assistant Clinical Professor at the UCLA School of Medicine. He is the Chief of Podiatric Foot and Ankle Surgery at the Santa Monica UCLA Medical Center and Orthopaedic Hospital, and is the Director of the University Foot and Ankle Institute in Los Angeles. Dr. Baravarian has disclosed that he is a Scientific Advisor for CrossRoads Extremity Systems and a member of the Speakers Bureau for CrossRoads Extremity Systems, Arthrex and Smith and Nephew.